SCDP have moved into Castle Hill which is really exciting news and a sign of changing times for the community! Suffolk Coalition is a central point of contact for all disabled people and their support organisations within Suffolk. Their Mission is: Suffolk Coalition of Disabled People is a campaigning organisation at its heart and will campaign on issues that affect disabled people regionally and where appropriate will take part in national campaigns. 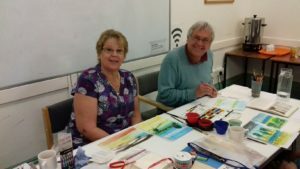 This group is one for anyone “who enjoys producing art and crafts in a creative and social setting at a reasonable cost. Our only rule is that we all enjoy what we do”! The group meets twice a week; on Tuesday afternoons and Wednesday evenings. The detail: Free art, craft tuituion & advice. Most people bring their own project & materials and do what they want to do but we can provide to those that need it to get them started. We do drawing, watercolour & acrylic painting, knitting, crocheting, card making, paper mache & working in clay. Or anything practible that people wish to do! Cost: £2 per session which includes tea, coffee & biscuits. Is their disabled access? Yes but it is limited at this time. Entry to the ground floor rooms is via a ramp at the front of the building, to the left of the main entrance. A Hearing Loop can be made available if requested in advance. Those who wish to are able to sell their art and craft at various exhibitions and table sales throughout the year. 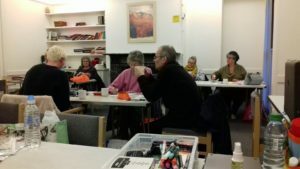 History of Castle Hill Arts Society (CHAS): We began in March 2013 and by February 2014 we became a registered charity so that we could start to apply for funding to help us develop. 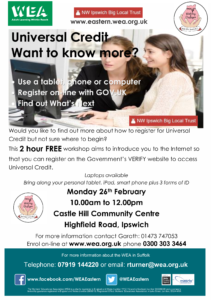 Later that year Ipswich Borough Council were impressed by our sessions at Castle Hill Community Centre and asked us to start a new group in Chantry which we ran for 2 years before rising venue costs meant it was no longer viable. We decided to move that group over to Castle Hill Community Centre too and now people attend both or either group from all areas of the town. Ground floor rooms are all available for community use and we have a variety of groups and activities using these rooms but there is often availability for more. Some 1st floor rooms are leased to charitable organisations as office space. Others are available on a casual basis as meeting rooms. All rooms vary in size and Wi-Fi is available throughout.